Why all whey protein powders are NOT created equal. Pardon our strong language, but we’ve got something to get off of our chest about the supplement industry. MOST supplements are pure junk. First of all, supplements are NOT the answer to a real fat burning lifestyle. Unfortunately, this also makes us “good guys” look bad. Today we have some VERY important facts about Whey Protein Powders. But, before we talk about why your Whey Protein could be toxic, let’s set the record straight. NOTHING is better than REAL food. If you have time to cook all your food ahead of time and you have access to a consistent supply of lean and healthy proteins, carbs, fruits, oils and veggies, then you probably do NOT need that much supplementation. However, supplements can be your friend when you don’t have time for real food or when you need convenience in today’s busy world. The majority of the supplements that we recommend are really just replacing food. While there is up front cost, you are actually saving a lot of money over the course of your journey by dramatically decreasing your grocery expenses. PLUS, it’s not nearly as expensive as going through a drive-through fast food joint or eating out. On top of all this, if your supplements actually come from a high quality source, they’ll actually have more vitamins and nutrients than most convenient foods. But you have to know the source of the manufacturing so you’re not being misled and ripped off. Quality supplements ultimately are a tool to be used as a “supplement” to your normal healthy eating. Vitamins and Healthy Oils are great supplements to use when you’re not getting the fruits, vegetables, and healthy oils in your plan on a consistent basis. Things like whey protein powder can be a great way to help you replace a meal when you’re on the go or in a hurry. They can help you cut down on hidden calories from regular convenience or restaurant foods AND save you a lot of money over the long haul. They are really a MUCH better choice than all the so-called healthy diet foods on the market. These foods contain nasty chemicals and fillers that actually turn off your body’s fat burning triggers. Hopefully this gives you a realistic viewpoint on long-term quality supplementation and the small (but important) role it can play in your fat loss plan. Again, the key word is “quality”. Do you really know what’s in YOUR whey protein powder? Even though big companies will entice you with fitness models and celebrities in their marketing and advertising, how do you know you can trust the source? Make sure your supplements come from a trusted advisor and make sure they have a “GMP” label on their bottle. This will also give you the comfort of knowing they have “Good Manufacturing Practices”. This will ensure that what’s on the label is actually IN the bottle. Next, get educated before (you buy whey protein powder) on what’s in the bottle that you may not even know about. For example, we’ve talked over and over again about the dangers of heavy metals and toxins in our environment, but who would have EVER thought these dangerous chemicals could be right inside whey protein powders? A recent investigation, including tests at an outside laboratory of 15 protein drinks, a review of government documents, and interviews with health and fitness experts and consumers, found that some whey protein drinks can pose the risk to exposure to potentially harmful heavy metals, if consumed frequently. All drinks in this test had at least one sample containing one or more of the following contaminants: arsenic, cadmium, lead, and mercury. These metals can have toxic effects on several organs in the body. That’s why it is so important to buy whey protein only after reading this article. Do not buy whey Protein powder until you read about Biotrust Low Carb. The founders of Biotrust Nutrition, Josh and Joel, had a goal to have products stand head and shoulders above the rest… and that’s exactly what they did when formulating their premium protein blend, BioTrust Low Carb. The folks at Biotrust are much more concerned about delivering only the highest-quality product to you as a consumer than they are about profiting from “cheap” production methods that don’t serve you and your best interest. Why buy whey protein powder from Biotrust…? It is 100% All-Natural. That means you won’t find any artificial colors, flavors, and most importantly artificial sweeteners in our protein… ever. The protein blend is sweetened naturally with stevia extract and a naturally sweet form of fiber call inulin. It packs 4 grams of high quality fiber per serving and only 1 gram of sugar per 24 grams of protein! 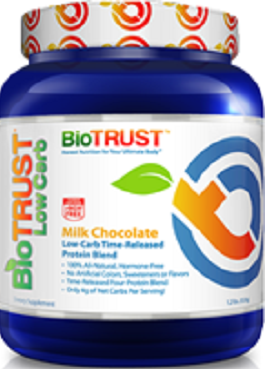 BioTrust Low Carb is also sourced from cows not treated with the dangerous growth hormone rBGH, and rBST. If the label doesn’t say rBGH- and rBST-free, don’t buy whey protein powder from that manufacturer.! Moreover, they went to great lengths to ensure the delicate proteins are carefully processed at low temperatures, preserving their bioavailability and natural state, unlike the vast majority of protein products out there loaded with “cheap,” denatured proteins that result from cheaper, high-heat processing. Then there’s the label issue. There are many ways that supplement companies try to fool consumers through the use of tricky, and unethical, labeling practices, including outright LYING on the label about the ingredients and the amounts of each ingredient in their products. While they still include whey protein concentrate at a 25% ratio due to a number of its unique properties, they also include the more expensive, exotic proteins in their blend like slow-digesting Micellar Casein (the Rolls Royce of all proteins), Whey Protein Isolate, and Milk Protein Concentrate at the same 25% ratio, to give you exactly what they are telling you they are giving you. While I was on Wendy’s Boot Camp, we purchased American Whey Protein Powder from her. I haven’t had it in a long time but was going to order some and found that there are posts about a different toxin/poison now in the powder, acesulfame potassium (newly labeled and mentioned hidden ingredient ). I also read that the Manufct has been sited for 3 FDA failed inspections. Your GL12 protein powder states it’s the same as Wendy’s? Is this the same stuff or is it different? Wish to purchase some but would like to know if it is safe because of what I’ve read…. Please educate me as to what to do. Thanks for the great questions. GL-12 Whey Protein Powder is Wendy’s protein powder, but it’s not from American Whey – it’s from a different manufacturer. I may be wrong, but I believe she may have sold both at the same time or started selling our product later (don’t quote me on that, though). Nevertheless, I looked at the ingredients for the GL-12 Whey Protein and verified with our manufacturer that acesulfame potassium does not exist in our product. So, you should feel comfortable with consuming GL-12 Whey Protein, if you choose. Thanks! I totally agree-natural is the whey to go!! Nothing beats it, but if you’re going for a whey supplement, read the ingredients! Spot on article. Has anyone been able to find a picture of the Nutritional Facts for “GL-12 Whey Protein Powder”? Also, wondering when it will be in stock again. I heard that too much whey protein can damage muscle tissue. Is it true that there could be negative side effects like you might get a kidney stone. I personally believe that whey protein is excellent for your body. I bet most of those “claimed” negative side effects are just people trying to sell you something else. I’ve always taken it and it’s never harmed me.